Bringing a fresh perspective to current debates over the “free market,” this wide-ranging look at how market economies are designed and constructed helps us understand how “the market” works and how we can build fairer and more effective markets. The “free market” has been a hot topic of debate for decades. Proponents tout it as a cure-all for just about everything that ails modern society, while opponents blame it for the very same ills. But the heated rhetoric obscures one very important, indeed fundamental, fact—markets don’t just run themselves; we create them. Starting from this surprisingly simple, yet often ignored or misunderstood fact, Alex Marshall takes us on a fascinating tour of the fundamentals that shape markets and, through them, our daily economic lives. He debunks the myth of the “free market,” showing how markets could not exist without governments to create the structures through which we assert ownership of property, real and intellectual, and conduct business of all kinds. Marshall also takes a wide-ranging look at many other structures that make markets possible, including physical infrastructure ranging from roads and railroads to water systems and power lines; mental and cultural structures such as common languages and bodies of knowledge; and the international structures that allow goods, services, cash, bytes, and bits to flow freely around the globe. 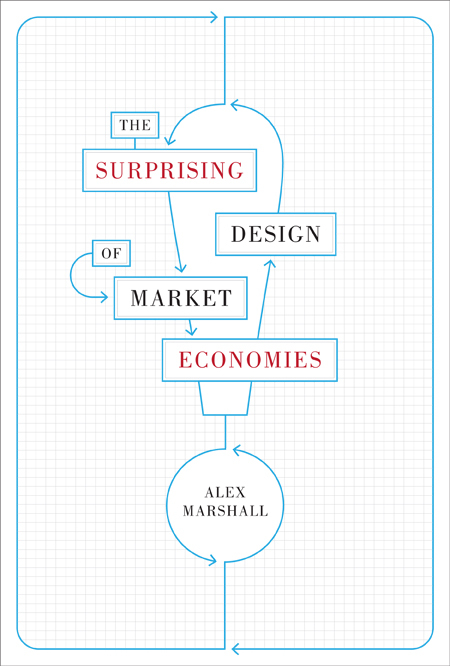 Sure to stimulate a lively public conversation about the design of markets, this broadly accessible overview of how a market economy is constructed will help us create markets that are fairer, more prosperous, more creative, and more beautiful. From the way roads and rails shape our cities to the way laws shape our economies, Alex Marshall has long sought and explored the underlying systems that shape our worlds. A journalist, writer, and former Loeb Fellow at Harvard University’s Graduate School of Design, he is the author of How Cities Work: Suburbs, Sprawl, and the Roads Not Taken and Beneath the Metropolis: The Secret Lives of Cities . Marshall is a Senior Fellow at the Regional Plan Association in New York. His work has appeared in the New York Times Magazine , Metropolis , Planning , the Washington Post , the Boston Globe , Slate , Salon , Architecture , Revue Urbanisme , and many other publications. Think on the means, the manner, and the end. Nothing's better than real than a real imitation. Not far from my apartment here in Brooklyn lies the lovely Prospect Park, almost six hundred acres of spacious meadows surrounded by rolling, forested hills and lakes and ponds. Just steps away from the busy, crowded streets of the city, you enter via one of two curving, arched tunnels at Grand Army Plaza. Walking toward the light at the end of either tunnel, you exit to find yourself in an enormous meadow surrounded by rolling hills carpeted with thick trees. As you wander around this veritable Eden, with waterfalls and winding lakes and hopping squirrels and twitting birds, you think how wise it was of the city fathers way back when to leave this piece of unspoiled nature as a beating, primal heart in the middle of this dense city of millions of people. And then, if you have some knowledge of urban history, you realize that this story you've told yourself is completely false. What's hard to accept about this beautiful landscape, even after one learns its history, is that it is completely human-made and maintained. City fathers didn't just leave nature as is, they constructed it. They hired Frederick Law Olmsted and Calvert Vaux, who designed Prospect Park in the 1860s a few years after they designed the similarly naturalistic Central Park. Crews following Olmsted and Vaux's plans pushed hills into place, cleared trees, and even brought lakes and ponds into being where none existed. For the lakes they scooped out earth and then painted the bottom with blue clay, brought in by barge from upstate New York, so the water would not just drain into the ground. Once in place, the grand park then had to be maintained, as it does now. The trees need trimming, the grass cutting, and the waterways being kept clear of debris and supplied with water. The placid lakes and burbling streams are linked up to the city's water system, the same one that supplies the city with drinking water. One of those beautiful waterfalls you gaze at actually is fed by a pipe and is the water source for all the lakes and streams in the park. This beautiful park is actually "one gigantic potted plant,"1 completely dependent on care and feeding by humans. I'm beginning this book with Prospect Park because it's a wonderful analogy for economic markets. Parks constructed in the naturalistic style pioneered by Olmsted and Vaux appear natural. If Prospect and Central Parks, as well as the Emerald Necklace around Boston and the dozens of other naturalistic parks designed by Olmsted around this country, had instead been created in the geometric, formal style favored by the French, on display in the Luxembourg Gardens in Paris, then there would be no doubt who created these works. But the great strength of Olmsted's and Vaux's craft is its tomfoolery. Similarly, markets, well-designed ones, appear natural. They appear as if they run themselves. They appear as if they just are. But in actuality, markets are human creations, some of our best and most important ones, but creations all the same. But if we forget that we are the creators, we risk seeing these worlds become corroded and corrupted. That's what happened to Prospect Park in the 1970s and 1980s as the city stopped maintaining it. Streams silted up, waterfalls stopped running, and weeds choked meadows. Without care, Prospect Park stopped functioning. I would like to start a new conversation, a public conversation. Typically in public discourse, we talk about markets as if the only choices are to submit to them, to regulate them, or to run from them. But we have forgotten that markets are designed, by us! We shape them as much as we do a presidential race, or any important public choice. Most of us don't know this, and even if we do, we forget. "It's not just laypeople who don't get this," said Gerald Frug, a Harvard law professor who studies local government, cities, and corporations. "A lot of people in a lot of disciplines, you have to tell them and then retell them. You tell them in the morning and by the evening they've forgotten." My background as a journalist who has written a lot about urban planning and architecture explains why I find it empowering to think about "designing" markets. The word calls to mind a human hand and rids us of the idea that markets simply are. The term also can prompt humility, because we realize what a debt we owe to our forefathers who have labored to create the complex markets we take for granted. Whether this book is primarily liberal or conservative in its political outlook is debatable. What is true is that writing it has given me even deeper respect for what came before, for the work of our ancestors. If we follow this metaphor of design, then we can come to its components, which are structures. For some time I've been concerned with structures, the walls we build that both constrain us and shape us, as societies. I see markets that way, as human-made structures that in turn shape and make possible human behavior. We shape our markets, and our markets shape us, to adapt Winston Churchill's remark about buildings. This of course contrasts with the view of "free," or "open," markets, which sees markets as defined by a lack of restraints. This view of markets is incorrect. Without structures, there are no markets. In this book, I look at types of structures that build markets, as well as the consequences and effects of those structures. Here are the types of structures I look at. I look at legal structures, that is, the laws we pass as cities, states, and nations. The most basic of these are laws creating the opportunity to own something, or property "rights," to use the common, if misleading, term. Laws allow us to create patents, corporations, cooperatives, and a range of types of markets that I will examine. These are the most basic foundation of markets. I look at physical structures, including roads, bridges, train lines, water systems, and power lines. The current term for such things is "infrastructure." Infrastructure systems support and establish markets. Because they come, in a sense, before a market, actions by government are usually necessary to establish infrastructure systems. It was the study of infrastructure, in particular transportation systems, that first led me into thinking about markets. The subject of infrastructure still fascinates me, because it relates to something dear to my heart, community. Infrastructure is a sterile label for the things we do in common, as communities of towns, cities, states, nations, and even the globe. In this book, I'll look at some of the infrastructure systems we have built and how they relate to markets. I look at the mental, or cultural, structures, the ones we have inside our heads, and the role government has in building them. These are a fascinating arena. Nations cultivate and create common languages and bodies of knowledge, which in turn make the functioning of markets, among other things, easier. The cultural realm is destabilizing to a person's preconceptions, because as one studies it one realizes that government has long been an actor in the most intimate terrain one has, one's mind. This is a vast subject, and I only touch the surface of it in a chapter on the creation of a national language and educational system. I look at the international structures, those we build between and among nations, which make possible global trade. These international structures encompass all three of the domains I have just named, legal, physical, and cultural. As is obvious when one looks into it, government-made legal and physical infrastructure in particular from international law itself, to undersea communication cables, to satellites over our heads make possible the torrents of goods, services, cash, and bits and bytes that stream around the world now. The flat earth depicted by New York Times columnist Thomas Friedman is no force of nature, but one we have constructed. Throughout these discussions, I look at the effects of markets and some of the overarching themes that can be drawn from their design. I look at the role of the state, the phenomenon of "path dependence," and other things. I look at the history of markets, including how it came to pass that serious thinkers made the error of conceiving of markets as akin to natural systems that operate by themselves. And I look to the future. Some might counter that I am talking about more than markets. The language that we learn, the education we receive, and laws against hitting your neighbor in the head are not just about constructing Homo economicus, able to go out and buy and sell things, and to receive a wage for his labor. Which is, of course, true. Most of the structures I talk about in this book are not only about markets. But they are vital to them, and I believe often would not be put into place without their contributions to markets. And it's always "markets," plural, by the way. There is no such thing as "the market." Another false construct relates to competition. We think of markets and capitalism as embodying competition, but markets depend more fundamentally on cooperation. In essence, we cooperate to compete. We agree on some underlying premises, such as not using violence; respecting contracts, patents, or whatever legal agreement has been made; and competing in a more limited sphere. Starting with the bankruptcy of the Lehman Brothers financial services firm in September 2008, the United States and then Western Europe entered what some are now calling "The Great Recession." Based on a financial bubble around housing prices and the mortgages associated with them, which included various and extreme sub-bubbles around financial devices such as "credit default swaps" and other esoteric tools, this Great Recession led to, most concretely, the loss of jobs for millions of people. It also led to the evaporation of billions, if not trillions, of dollars in wealth, and the bankruptcy of banks and other entities, including at least one entire country, Iceland. These events underscore the constructed nature of markets, as well as their vulnerabilities to corruption from faulty ideology and venal selfishness. The faulty construct that government could "get out of the way" and that markets could then expand in an unencumbered way helped create the Great Bubble that preceded the Great Recession. Markets operate within frameworks created by government. They are not something that government "gets out of the way of." One improbable result of the Great Recession, which has not really ended at the time of this writing, is that it appears to have strengthened populist movements to let "the market" operate on its own, unchecked. Serious academics who backed the existence and merits of a "free market," such as those freshwater Chicago school economists around Lake Michigan, found their position seriously weakened. Many admitted they needed to rethink their views. Judge Richard Posner, who although not an economist had been a spokesman for this school of thought, essentially admitted he was wrong.4 But populist movements that advocate less government regulation and the power of the free market seem stronger than ever. This is evidence of how contagious the belief system of the natural free market is, where all events become evidence of it, even ones that contradict its very existence. This book is not about regulating markets, or the "regulatory sphere," as it is commonly called. I have nothing against the Federal Trade Commission, the Food and Drug Administration, the Occupational Safety and Health Administration, the Federal Communications Commission, the Securities and Exchange Commission, the Environmental Protection Agency, and so on. They for the most part do good and important work. But they get in the way of the conversation I'm trying to have. I'm talking about designing markets, not regulating them. The metaphor, or model, of regulating markets presupposes that the market being regulated is somehow there already, waiting to be regulated. I'm saying and showing how this is not so. We designed the markets, before we started regulating them. Corporations are a good example of this. The political Right and Left debate endlessly how much to regulate corporations, or whether to "let them go," to unleash them, without noticing or talking about the fact that the corporation is a government creation. Governments create corporations. If we really wanted to alter corporations, we should tinker with their essential DNA, the laws that make it possible to create corporations and grant them a specific set of expansive powers. We could create, for example, a National Companies Act, rather than leave it to states, mostly the state of Delaware, to define how corporations act. More about this later. This book is not about the establishment of a cap-and-trade system to control the output of carbon, even though almost no better example exists of the invention and creation of a market, one being born as you read this. This book's mission is to provide a broad overview of how a market economy is constructed, of the various components and how they came to be. My hope is that this book, rather than prompting any specific reform, will stimulate a conversation about the design of markets, so we can create ones that are fairer, more prosperous, more creative, and more beautiful. Their wanderings through the almost limitless building were interminable; they would set off as if for some unknown land, and unknown indeed it was because in many of those apartments and corners not even Don Fabrizio had ever set foot (a cause of great satisfaction to him, for he used to say that a palace of which one knew every room wasn't worth living in). Markets are a wonderful thing, I thought, as I cruised the aisles of this supermarket on Sharon Amity Road in Charlotte, North Carolina. One aisle had probably ten different kinds of tortillas. Compare Foods, which was the name of the large supermarket, had different kinds of dried beans in big bins that people could go through with their hands, and numerous bins of different types of dried chili peppers, all arrayed in their various colors and sizes. This was in addition to all the usual supermarket stuff, like Rice Krispies and Pampers. Charlotte, formerly one of the whitest of white-bread cities, has had its Latino population swell from insignificant to more than 10 percent of the population in just a decade or so. These immigrants were brought in by the city's burgeoning economy, including its enormous banking sector, which had fueled the city's rise to prominence. Charlotte was home, as of this writing, to the corporate headquarters of Bank of America, one of the largest banks in the country. (The financial crisis of 2008 weakened Charlotte as a banking center. One of its twin powerhouses, Wachovia, was facing bankruptcy in 2008 and was acquired by Wells Fargo with government assistance. Charlotte's other big bank, Bank of America, kept in the game but was viewed by many as seriously weakened because of its exposure in home mortgages.) The immigrants weren't brought in to work in the banks, for the most part, but bankers need computer programmers and computer programmers need houses built for them and construction crews like cheap, skilled labor you get the idea. The presence of these brown-skinned immigrants, many of whom did not speak English well and were here illegally, had not gone down easy in this city traditionally dominated by white Protestants. While employers liked the cheap labor, the city's African American population saw competitors that brought down wages. Many people, particularly conservative Republicans, disliked the presence of tens of thousands of people openly flouting the law, and the law openly ignoring them, essentially. All big and serious issues. All this meant nothing to "the market." If you were working on a construction crew in Charlotte, and wanted a particular kind of tortilla and bean and chili pepper, there was a good chance you could find it at Compare Foods, which was not a specialized Latino market, but just a regular supermarket in an area that happened to have a lot of Latinos. As if by magic, the goods materialized. Suppliers found a way to deliver them to this supermarket, which found a way to find the suppliers. It was amazing, I thought to myself. Supply and demand did its job. There are various analogies for "the market," or "markets," as I prefer. In the Introduction to this book, I compared markets to great parks that are so well designed the designer disappears. Bruce Scott, a professor at Harvard Business School, compares markets to professional sports, where official bodies decide where the lines are on a field or court, what the official ball size is, and what the rules are, and then stand back and let the players compete, while penalizing those that break the invented rules. In common language, we talk about "the market" for dating in a particular city, or for playing bridge. This is fine. It's when the market entails buying and selling for a price that the designer, usually government, enters. Accepting all this, we can also accept that it does its job very well, this market for Latin foods inside this formerly white, Protestant city. But it should be seen for what it is. My point here is that there is no abstract "market" that will solve all our problems for us, and work without the help of human hands. Markets, even the most open ones, are tools, designed by human hands. Conventional "open" markets are great and have their uses. But they also have their limitations, and they should be recognized as the constructed things they are. It is this open, or free, market that so many people have fallen in love with, and which does not exist. In this chapter, I rip the tissue paper off this surface appearance of markets and reveal the hardware underneath. I also look at how this appealing but misguided notion of a self-operating market developed within the emerging discipline of economics in the nineteenth and twentieth centuries. In the end, I want us to acknowledge that there is not just one market, but many, countless really, beyond the ability to number, yet all constructed by human hands and minds. Markets, in the sense of both a place for buying and selling and the activity itself of buying and selling, began about five thousand years ago, said Keith Roberts in his The Origins of Business, Money and Markets . Initially, trading was slight. Goods were exchanged through barter, through "gift economies," or by edict of powerful central states, as under the masters of the Persian empire, who had great wealth, but there was little trade in conventional terms. Developing true markets involved mastering a series of conceptual challenges over centuries. As with so much of our society's heritage, it was in ancient Athens that modern markets began to emerge, under the leadership of the state. Among the most significant developments was coinage. This was as much a conceptual challenge as a feat of production, because money as an idea and tool is not immediately obvious. People had often traded things for gold or silver, but that is different than accepting a piece of gold or silver, eventually a coin, when making a trade, regardless of whether one personally needed gold or silver. Money is such a convenient tool because it can be used to buy anything. The Athenians grasped this quickly. Using silver from mines it controlled, the Athenian state began producing the famous four-drachma piece, often called "the owl" because one side of the silver coin was stamped with that large-eyed bird, which was the symbol of the goddess Athena, the patron saint of Athens. It became the coinage of the ancient realm, accepted all over the Greek world and beyond. After Athens lost leadership of the ancient world, markets and the development of business practices moved to ancient Rome, which, along with its empire, developed what could rightfully be called a global economy, insofar as the term refers to the portion of the globe Rome controlled. This global economy would wax and wane with the Roman empire, and it would eventually collapse with Rome. What's important to understand for my purposes is that trade only happens within the framework of a state. As nations collapsed into feudal fiefdoms, most trade did as well, and markets in a contemporary sense vanished. As nations and states emerged in the Renaissance and Enlightenment periods, so again did markets, with their specifics put in place by the controlling powers. Whether markets were global or merely local, a key question was where would they take place, because exchanges needed to take place in a physical location. This location was usually chosen and operated by the state. In medieval times, the Crown usually sponsored and carefully controlled the colorful fairs highlighted in fairy tales and Arthurian legends where goods were sold and jousts were held. "In the four principal cities of Champagne six fairs were held, each of which lasted for 50 days, including the business of arranging and opening the fair," said Max Weber in his General Economic History . Fairs reached their greatest development in size and importance in the thirteenth and fourteenth centuries, he said. In Venice traders still gather in several ancient public buildings near the Rialto Bridge, where they have been gathering for more than a millennium. Most cities of any age have had their version of "the city market," cavernous and often physically grand buildings of iron, stone, or wood where sellers of meat, fish, dairy goods, and produce would congregate in stalls and sell their wares. Such markets were usually built by the city and leased out to agricultural producers and other vendors. Cities used to compete to see which had the grandest city market building, the same way cities now compete with football stadiums. These markets still survive in some cities. In Barcelona vendors sell blood sausage, Manchego cheese, fish, and produce under a huge roof right off Las Ramblas, the grand promenade through the heart of the city. In Seattle, Pike Place Market, a rabbit warren of stalls set into a cliff overlooking the Puget Sound and a brutal elevated freeway, still survives, and not just as a tourist trap. It remains a place for local farmers to sell produce, even though restaurants and other vendors are in the mix, because there is a commission that oversees the market and must approve vendors. The first written goal of the commission is that the market be "A place for farmers to sell their own produce." Rules such as these have been common in city markets, even at their inception. When you're buying some eggs from a vendor housed in a building constructed and owned by the city you live in, it's clear that government has something to do with markets. But as markets have become less physical, and as the thread between government and markets has become longer, it becomes easier to forget government's involvement in markets. Economics as a Science: A Useful Metaphor or Blind Alley? As trade increased in the seventeenth and eighteenth centuries, the idea of the "free market" emerged as a reaction against the mercantilist economies of the time. It was a useful idea, but it was taken too far, a process that began in the early to mid-nineteenth century. It is worth understanding how this happened. Essentially, leaders in the new field of "economics" attempted, in an act of hubris, to pass off their brainchild as being on par with the great physical sciences that were emerging then as well. Implicit in the comparison was a faulty metaphor, but one that lasted. In 1969, the Royal Swedish Academy of Science began awarding what is usually referred to as the Nobel Prize in Economics, the first addition to the ones for physics, chemistry, medicine, literature, and peace created by Alfred Nobel in 1895. Although the award was technically placed in a different category than the other prizes, its creation was seen as validation for a century-long quest by economists to have economics considered a science, just like physics and chemistry. The story of how economics moved from something that was seen as part of political or moral philosophy, which is to say thinking about how the world should work, to a science, which looks at how the world does work, is a tragic one. Science explains, and explanations provide both light and power. The periodic table of chemical elements enables someone to create both Bakelite and Viagra. The theory of relativity helped produce the atom bomb. What if we could understand human behavior in a similar way? Particularly human behavior as related to wanting stuff, to buying and selling things? Wouldn't such understanding give us tools of unimaginable power, to help us organize and channel human behavior in ways that would correspond with these newly discovered laws? This is my sense of the thinking of the great eighteenth and nineteenth-century thinkers who did this work. These great men (and they were largely men) were laboring in the shadow of the revolutions in math, physics, and chemistry of those times. (It is relevant that Sigmund Freud and others would soon attempt to create a similar science of the mind, except dealing more with emotions and desires.) These early economists wanted economics to come up with laws that resembled the laws of gravity or thermodynamics, and had similar explanatory power. Nassim Taleb, author of The Black Swan , in speaking about economists a century and a half later, called their ambition "physics envy." When Adam Smith in 1776 published The Wealth of Nations , the book that is a bible of sorts to economists, he viewed himself as a moral philosopher, not a scientist or an economist. But he could be said to have planted the seeds of viewing economics as a science with his descriptions of the division of labor among factory workers making pins, and derivation of insights from those workings that might be compared to principles or laws. Smith, at least in the English-speaking world, invented the idea of the modern market, where people enter, buy and sell stuff, and leave everyone better off. Writing in an age of mercantilism, when so many aspects of trade were tightly controlled, this idea had great merit. What Smith didn't see as clearly was that government put into effect the rules that created this place of neutral exchange. He also didn't note that neutral exchange is not always for the best, nor that producers sometimes need the rules stacked in their favor, so they can make quality better and pay better wages. Underdeveloped countries sometimes need the rules stacked in their favor so they can get a head start. But whatever the specifics, Smith certainly did not see economics as a science. And he talked mostly about how things were produced under markets, less about distribution, the part that has so fascinated modern economists. Leon Walras, a French mathematician, is generally credited with coming up with the general theory of equilibrium in economics, which is that supply and demand tend to balance each other out and come to rest at a point of equilibrium. In the fascinating book The Origin of Wealth: Evolution, Complexity and the Radical Remaking of Economics , Eric Beinhocker tells how Walras actually borrowed these concepts wholesale from an 1803 physics textbook to come up with the equations and theories in his seminal work in the 1870s, Elements of Pure Economics . Apparently, Walras had an "aha!" moment when he conceived of the idea that human beings and their desires may work in ways similar to falling bodies or other phenomena in physics. "In building his equilibrium model, Walras put to one side the production half of the economy and focused on trading between consumers," said Beinhocker. In his model, he assumed that various goods already exist in the economy and the problem is to determine how prices are set and how the goods would be allocated among the individuals involved … Walras's willingness to make trade-offs in realism for the sake of mathematical predictability would set a pattern followed by economists over the next century. An important reason for this focus on allocation of finite resources was that mathematical equations of equilibrium imported from physics were ideal for answering the allocation question, but it was more difficult to apply them to growth. Equilibrium systems by definition are in a state of rest, while growth implies change and dynamism. Walras even lifted the phrasing from one chapter in the physics book that was entitled "On Conditions of Equilibrium Expressed by Means of Equations." While Adam Smith had focused on how goods were produced and best practices associated with that, Walras began a shift toward the distribution of goods and how markets "cleared" that would be continued into the present day. After Walras, the scientification of what soon would be called economics continued apace. A big step was the publishing in 1890 of Principles of Economics by the Cambridge professor of political economy (emphasis mine) Alfred Marshall, considered by many to be the father of mainstream economics. Marshall consciously opted to not call his book, which was brilliant in many respects, Principles of Political Economy . It was part of his effort to make economics more of a science, and to disassociate it from the messy world of men and their decisions. By dropping the term "political economy," Marshall was leaving behind the governmental and political decisions and acts that produce markets and economies. He wanted to depoliticize economics, which, given that economies are political creations, is kind of like depoliticizing politics. But amazingly, the name change worked. In a generation or two, the term "political economy" would be relegated to the backwaters of universities. "Marshall clearly understood the stakes in the new terminology," said Michael Perelman, who summed up this evolution of economics in The End of Economics . Marshall saw the change in terminology as helping economics become "an objective science, capable of representing the interests of society as a whole." Not only could the new profession of economics claim to practice science, but economists could, like physicists or chemists, claim to be above or outside of politics and its choices. Like Walras, Marshall continued the shift of economics away from analyzing how production works to how exchange works. "This new emphasis on the mathematical modeling of exchange had several appeals," said Perelman. By stressing the formal mathematics of exchange relationships, economists could take a more scientific posture. Although political economists could hardly pretend to have a monopoly on the analysis of production, no other discipline could claim to be a science of exchange. Moreover, an analysis of the economy from the perspective of exchange was relatively effective in obscuring conflict. Both parties must benefit from voluntary exchange; otherwise the exchanging would never have occurred in the first place. Here's one way to look at markets that may cut through this science-or-not question. While mating is a specific instinctual act and thus amenable to being described through the science of biology, marriage is a human institution. So with markets. While wanting stuff may be elemental, buying and selling as organized, mostly peaceful transactions take place only through a process and within a framework constructed by government. Any "laws" about how markets operate need to take this into consideration. In the twentieth century this conversion of political economy into the science of economics continued apace, as well as efforts to turn other disciplines into sciences. The twentieth century opened with Sigmund Freud and others working to come up with laws as to the way individual humans worked, which would be called psychology. John Dewey and others were creating other "social sciences" in the fields of education and anthropology. Urban design, which dealt primarily with streets and buildings and water lines, was giving way to urban planning, which dealt with numbers and regulations. There was a sense that science could help humankind leave behind many of its troubles in many areas. Economics would not be left out. Although different schools of thought developed, most focused more on exchange than production and continued this analogy of human beings working similarly to natural systems. John Maynard Keynes in the 1930s helped counter this trend with his General Theory of Employment, Interest and Money , which asserted that labor markets do not always stabilize at near zero unemployment, and that government intervention is sometimes necessary to prime the pump of demand. In this, he was arguing against his old teacher, Alfred Marshall. Despite the strength and commanding influence of Keynes's work, neoclassical economists would wage a fifty-year rearguard action against Keynes. Even those who praised Keynes sought to cast his views as part of economics as science. Paul Samuelson, in his influential textbook Economics: An Introductory Analysis , helped mathematize Keynes, which would give the illusion of certainty and glow of science to Keynes's work that Keynes himself would have probably rejected. Nassim Taleb in The Black Swan said Samuelson is an example of "badly invested intelligence," as he converted Keynes's useful uncertainties into precise but erroneous equations. I don't want to pretend that economics as a discipline has accomplished nothing in its two centuries or so of existence, despite its misplaced classification as a science. It took a Great Depression and a Second World War, but there is knowledge now that if an economy falters, you lower interest rates and expand the money supply through a central bank. This knowledge did not come cheap. Often it took rebels like Keynes, or politicians acting on their own, to work out these principles. President Franklin Roosevelt abandoned the gold standard in 1933, something that immensely helped the country, against the advice of virtually every expert. It is revealing to read still-well-regarded economists like Joseph Schumpeter, whose only advice to government during the Great Depression was to do nothing. As important as these things are, though, economics as a discipline would do well to spend more time and energy thinking about how markets could be constructed, and what purposes they can serve. Economics should be about more than questions of deficit spending, interest rate hikes, money supply, and so forth. Lewis Mumford, the great writer on urbanism, asked, "What is transportation for?" The same question should be posed about production and economics. What is an economy for? What are markets for? To realize that markets are our ongoing creation is then to ask, "Why and for whom?" We could think of markets, rather than as just a way of creating wealth, as playing fields that we create for varying purposes. We could design a copyright system, for example, to encourage experimentation and creativity, as well as compensate creators. We could design a property rights system in ways that enrich the society, as well as the property "owners." We could design corporations in ways that further business creativity and societal advancement. The possibilities are endless. Often only the free market ideologues concern themselves with the design of markets although they probably wouldn't use this term and they use their simplistic theory like a stick, whacking everything in sight to explain how it could be "marketized" further. There are more creative ways to design markets. The insidious thing about this term "the free market" is that nominal opponents of it accept its validity as a concept. Thus a carcinogenic idea is smuggled into the body politic. If you were to open The New Yorker in October of 2008, you might have spotted a fancy ad occupying two pages that asked, "Does the Free Market Corrode Moral Character?" Under this heading, a variety of scholars, including Robert Reich, Bernard-Henri Lévy, Jadish Bhagwati, Qinglian He, and John Gray, answered this question in various ways: yes, no, it depends, etc. Sponsored by the John Templeton Foundation, this was, I gathered, supposed to be an example of how you can have a civil conversation about a sensitive subject, thus leading to greater enlightenment. Actually, what it is is an example of how you can advance and solidify a concept by asking a question where the concept is an unexamined assumption. The question "Does the Free Market Corrode Moral Character?" assumes the "free market" as a given. It doesn't ask whether there is such a thing as a free market and, if so, what it is, or hold that concept up for examination. It simply assumes there is such a thing, and that we all know what it is. If I were answering this question of the John Templeton Foundation, I would respond, "There is no free market. There are only markets, and government creates them. Markets are diverse in character and have different rules and boundaries. Whether a market corrupts or make the world more moral depends on those rules and boundaries. A market where government establishes a price on Jews' heads obviously corrupts. A market that establishes a place to buy green beans does not. There are no 'free' markets, in any meaning of that word, whether free as in open, or free as in costless." The term "the free market" is really a slogan masquerading as a neutral description. Neil Postman, in an essay in his book Conscientious Objections , suggests that rather than teaching people to be smart, it might be equally effective to teach people ways of not being stupid. He listed ten ways of being stupid. One of them was to use euphemisms, which, in Postman's words, are no problem if used as mild substitutes for unpleasant things. "But when euphemism becomes a dominating mode of expression in our institutional life, it is dangerous and ought not to be tolerated." "Free market" is a euphemism, usually an unconscious one, which makes it more dangerous. But for what? The word "free" in free market can have two meanings. The first is that a market is open and without rules or conditions. This meaning is demonstrably false, as I'll show over and over. You need rules to have markets. Second, there is the meaning of "free" as in without cost, meaning no one has to pay for it. This is also not true, because our economic system has great costs. Even the freest markets in the modern era depend on government-provided or paid-for education and infrastructure, as well as functioning courts and so forth. Finally, there is the word "market" in its singular form. The phrase is usually "free market," not "free markets." This suggests that there is only one market, one huge open market, not many, constructed markets. The financial panic that gripped the world in 2008 and 2009 helped shake the belief in markets as natural, or operating by themselves. Even though these mammoth financial markets were always clearly constructed things, there was still some belief that they could self-correct. John Lanchester wrote in The New Yorker in 2009, "This should be an enduring lesson of the crisis an understanding that the rules governing the operating of markets were not handed down on stone tablets, but are made by men, and in constant need of revision, supervision, and active, imaginative enforcement." Despite the sloganeering and the investment in the concept of the self-operating free market, some people get that this just ain't the way things are. John McMillan, in his book Reinventing the Bazaar: A Natural History of Markets , stated: "Faith is not needed. The 'hand' that guides the market may be invisible, but it is not actually supernatural. The market is not omnipotent, omnipresent, or omniscient. It is a human invention with human imperfections. It does not necessarily work well. It does not work by magic or for that matter, by voodoo. It works through institutions, procedures, rules, and customs." While I like McMillan's thoughts above, I prefer to talk about "markets" in the plural, because for one thing, it suggests there are choices. I also like the word "design," because it states even more clearly that markets are our handiwork, and that we have choices in how we sculpt them. The most fundamental of these postulates was a notion that the utilitarians had taken over, in apparent innocence, from the theologians: the belief that a divine providence ruled over economic activity and ensured, so long as man did not presumptuously interfere, the maximum public good through the dispersed and unregulated efforts of every private, self-seeking individual. The non-theological name for this pre-ordained harmony was laissez-faire. The late scholar and public intellectual Tony Judt, in an essay entitled "Captive Minds" written shortly before his death in 2010, made a similar observation, which is that the homage paid to the market can be similar to the Marxist Left's religion-like faith in Communism and its supposed laws and historical inevitability: "But 'the market' like 'dialectical materialism' is just an abstraction, at once ultra-rational (its argument trumps all) and the acme of unreason (it is not open to question)." The conservative belief in "free markets" is a bit like the Catholic Church's insistence that the Earth was at the center of the solar system in the 12th century. It's widely believed by those in power, those who challenge it are branded heretics and ridiculed, and it is wrong. In actual fact, there is no such thing as a "free market." Markets are the creation of government. Governments provide a stable currency to make markets possible. They provide a legal infrastructure and court systems to enforce the contracts that make markets possible. They provide educated workforces through public education, and those workers show up at their places of business after traveling on public roads, rails, or airways provided by government. Businesses that use the "free market" are protected by police and fire departments provided by government, and send their communications from phone to fax to internet over lines that follow public rights-of-way maintained and protected by government. Markets are a creation of government, just as corporations exist only by authorization of government. Governments set the rules of the market. And, since our government is of, by, and for We The People, those rules have historically been set to first maximize the public good resulting from people doing business. Roberto Unger, the Brazilian-born Harvard law professor and political advisor, gets it. And Jeffrey Sachs, a well-regarded economist, does not, or at least didn't use to. In the fall of 1999, while on a fellowship at Harvard University, I audited their class at the law school "One Way or Many?," which was a weekly debate between Unger and Sachs over the best way or ways for developing nations to progress. Sachs, then perhaps more of a free market purist, defended the "Washington consensus" that there was only "one way" for a developing nation to progress. The Washington consensus was that a country should open its markets, get rid of state controls, and embrace globalism. Unger maintained that there were "many ways" for a nation to progress, and the market itself was open to experimentation and tinkering. "You can't succeed by imitating," said Unger in the November 8, 1999, class inside the semicircular lecture hall inside Austin Hall, a grand brick and stone building designed by H. H. Richardson as Harvard Law School's home. Unger said that growth and prosperity should be used for the self-expression of a people, both as a group and as individuals. The creative nature of capitalism should be recognized, not just for the individual, but also for the society that constructs the rules capitalism depends on. During that same class I stood in the big lecture hall and asked a question. The two men had been discussing China, which even then was taking off in prosperity and growth. I asked Sachs: "Doesn't the success of China threaten the market model and the 'Washington consensus,' given that China has developed over the last 20 years without a judicial system, without private property rights, without free currency, and all sorts of stuff? Doesn't this mean there are many ways, rather than just one?" "No," said Sachs shaking his head, a well-built man with a head of nicely placed dark hair. The only reason China has been able to rise, he said, is that it started so far below. "When you start at a peasant level, it's easy to lift the hand of the state and see growth. These guys on the coast are making computer CDs and sneakers. It's easy." "I disagree thoroughly," Unger said. "The questioner is right. [Ahh, with what satisfaction I heard Unger's words at the time.] With the market project, there is always an exception. Always an exception that proves the rule. In the United States, the US during World War II massively rebuilt the economy with cooperation between state and private enterprise. It lifted the country out of the Depression. But this was supposed to have been impossible. It's not about technology, it's about institutions, political and legal." This was an important exchange. Time has revealed that Unger was more correct than Sachs. China's growth has not been driven by the lifting of the hand of the Chinese state, as Sachs said. The Chinese state has been directing growth, managing it, even micromanaging it, according to all reports. This management, which included setting exchange rates for the nation's currency and not allowing the free flow of capital, enabled China's leaders to avoid the financial crisis of 2008–2010, something they were quite smug about. Actually, China's state is so embedded into its version of capitalism that it's difficult to summarize. "China is a seething cauldron of experimentation in the institutional invention of the market," said Unger, who has a mane of white hair and always seems preoccupied, in a later interview in his office in 2008. The United States was like this in the nineteenth century, he said. What made Unger so good is that he caught the air of creativity and possibilities that can come into the design of markets. "My driving argument is that the market does not create its own presuppositions," Unger said in 1999. "The world market depends on larger background conditions. We can't achieve stuff by simply 'signing up. … The work of democracy and experimentation remains incomplete. We must apply to the market its own experimentalist medicine." "A political economy," he said, "is not a perpetual motion machine." Looking in the rearview mirror, it is easy to see that we can build market economies many different ways, using and inventing many different models. On the level of countries, the United States and European nations have built their markets on judicial supervision and private property, with huge variations within that simple principle. Japan, Korea, and other Asian nations have developed variations on those themes, with more overtly state-led components. China is developing its own model, one where the state plays a far more direct role, with the judiciary and private property playing a subordinate role. As we look to the future, what's important is recognizing that we as a democratic society have choices, and that we should talk about those choices. Our hands are on the steering wheel, more than we usually recognize.